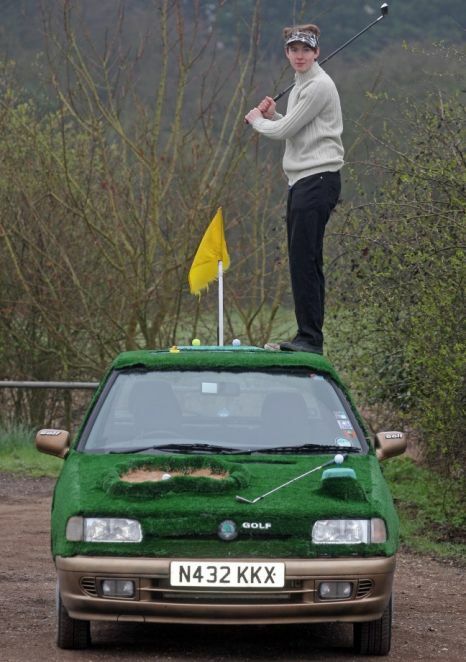 22-year-old John McArthur is the owner of the world’s only golf course on four wheels – a Skoda Felicia covered with fake grass and complete with a sand bunker. The young Brit from Rayne, Essex, is surprisingly not a big fan of golf, but as soon as he saw this lovely Felicia on eBay, he new it would be the one to replace his old Renault Megane. He even got a bargain price of £347, so buying it was a no-brainer. As soon as he parked it in front of his front door, his sister said she wouldn’t be caught dead in it, but John’s friends love it and people keep taking photos of the green vehicle and ask about him, wherever he goes. 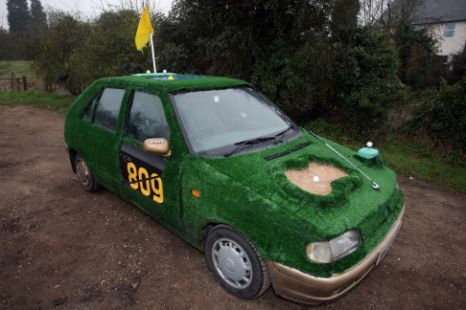 The golf-mobile is almost completely covered in fake grass and comes complete with a hole flag on the roof and a sand bunker on the hood, and while it doesn’t inspire him to take up golf, young Jake McArthur says he’s happy he never has to wash it. We’ve featured our share of quirky art cars here on Oddity Central, but this is definitely one of the most ingenious ones.